My friends father died last week. He had Alzheimer's and she took care of him for 15yrs. She would like to have a quilt made out of his clothing. ( Not his ties ). I have never heard of this, but can see how it would be possible. Any suggestions or advice ? You might check out this link - she does baby wardrobe quilts - but it may give you some ideas. Also check out Bonnie Hunter's website - she shows how to cut up mens clothing and then makes scrappy quilts. The design will depend on the type of clothing -- men's dress shirts, plaid shirts, t-shirts, and you can include the pants, too. Then, do you want large pieces of the clothing, or do you want it cut up and made into quilt blocks. The links her are some good examples of square blocks of clothing with sashing. If you want to make quilt blocks, then choose a block or two. The pants might make good sashing. Since the clothes are probably part polyester, I'd probably use a polyester batting, probably light weight, although any weight would work. I quilter in our group made a quilt with her husbands shirts by cutting out squares and joined together. Some had a pocket left. She appliquéd hearts on. She was amazed that his shirts were so coordinated. What she loved most was snuggling in it and smelling his after shave still on the pieces. She tops it up these days. I have also seen grandma fan made with the ties. You should check out Sylvania Quilting - www.sylvaniaquilting.com. 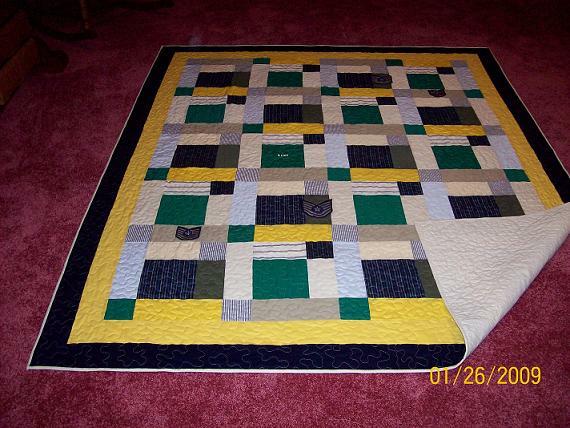 Jan is a longarmer who specializes in memorial quilts and she does beautiful work at a reasonable price. No connection - just a happy customer! Here is a link to a quilt I made using my dad's plaid flannel shirts. There were not enough of them for a bed size quilt so I added some additional flannel. I just finished one for my best friend from her mother's blouses. They were poly cotton. I did a QAYG and appliqued hearts in each block. She loves it and i found that i really enjoyed making it. My Father died several year ago after 16 years of illness, during which my DM took care of him 24 hrs a day. I took his western shirts and years of pjs and cut most of them in 2 1/2" strips for a log cabin. I still have issues every time I open the tote full of strips and some larges pieces. Cannot seem to start due to all my memories. Also have a box of my DM's clothing to cut for quilt and have the same problem. Can you tell I was VERY close to my parents? My cousin who's a quilter from beginning to end made a beautiful quilt out of her husband's underpants. The whole family was happy with it. The husband's daughter was the recipient of the quilt. She helped with his care from throat cancer which was very quick. My cousin has made quilts from his clothing for everyone of his children. Every piece of material has a story attached. She had photos and whoever was in the photo with them at the time was the recipient of what ever he had on at that time. She took their wedding clothes and made a quilt from them for herself. 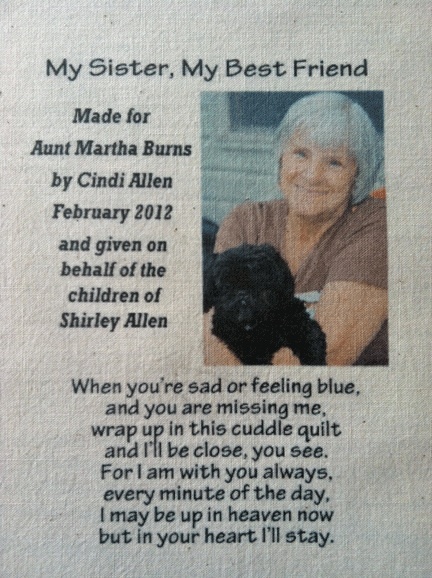 She said she had happy tears the whole time she made the quilts. Oh shoot. Sorry. I don't know why that picture posted twice!! Oh dear. I didn't see that your mom passed away, too. I'm so sorry! Thanks so much everyone for all your wonderful ideas. Much appreciated! A friend of mine's DH passed too and I was asked to do the same thing. This is what I made for her. I have a friend who took her husband's shirts and made a baby quilt for each one of his daughter's first baby. He died quickly and young, even before his girls married. The quilts were made by the daughter's step-mother (my friend). I thought it was such a thoughtful generous gesture to her step-daughters. I have a bag of some of my dad's shirts.. I haven't cut into them, as I don't know what I want to do.. My mom donated most of his clothes. I am okay with that, as there are too many people that can use clothes.. The shirts in the bag smell like dad.. It's a little spooky.. I have made three quilts using old clothes. I recommend making a crazy quilt. This way you can use everything. The more textures and colours you use the more interesting your quilt. Make sure you wash everything! You can use an old sheet for your foundation for your blocks. The thrift store is also a good source. Just make sure it's really thin. Sorry I can post my pictures as I don't have them with me. The flowers are made from dad's sweatshirt in my sisters and the blocks surrounding it are mom's clothes. The rectangles were from her jeans. I incorporated the sweatshirt into the center blocks in my brother's. Last edited by cindi; 06-29-2013 at 01:11 AM. Cindi - they both are beautiful! I haven't thought of doing that until this thread. Thankfully my parents are still both alive and doing well in their mid-80s. TFS!